March 23, lunch. 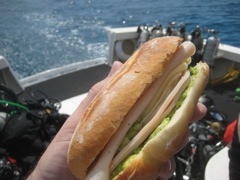 A turkey and cheese and guacamole sandwich. In the Caribbean off of Cozumel, while diving. With Jan, and a whole bunch of people that Ken found (Ken, Gabby, Stuart, Terri, Dan, Liz). March 23, dinner. In Cozumel. I can't remember the name of the place, but it was a little hole-in-the-wall. 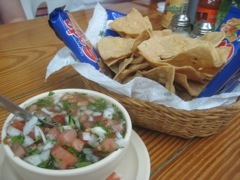 This was just the chips-and-salsa course. March 23, dinner. Seafood plate. Octopus, squid, shrimp, grouper, maybe a clam or two. With salad and rice and some cooked steamed vegetables. Maybe they were boiled. It was very tasty for a reasonable price. March 23, dessert. Some coffee and chocolate gelato, in Cozumel. 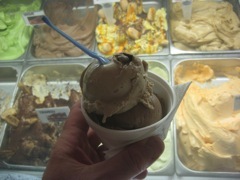 From Bacio, "Dolce e Gelato." March 24, breakfast. 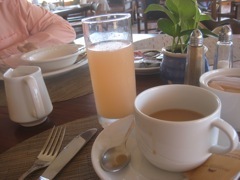 Coffee, grapefruit juice at the Fiesta Americana with Jan. In Cozumel. March 24, breakfast. 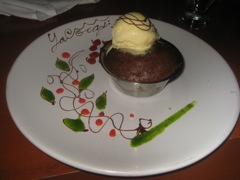 A little chocolate bread in Cozumel at the Fiesta Americana with Jan. 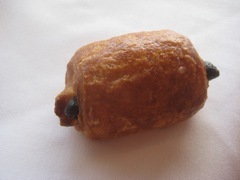 The little sweet breads are always great in Mexico. March 24, lunch. 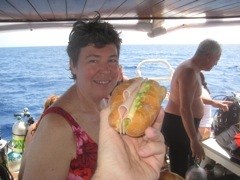 Between dives in the Caribbean Sea off of Cozumel. 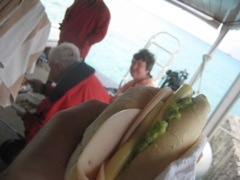 A turkey ham, cheese, and guacamole sandwich. Jan and Rolly are in the background. March 24, dinner. At HC of Monterrey. 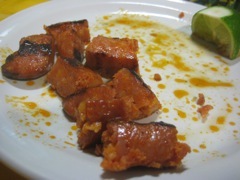 Chorizo appetizer. Cozumel. March 24, dinner. At HC of Monterrey. Ribs! Really quite nice. Not smoked, but grilled and tasty all the way around. 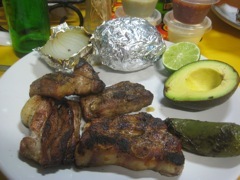 With a jalapeño, avocado, lime, potato, and onion as sides. 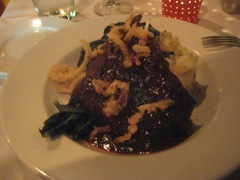 I think that the ribs were just as good as the skirt steak, although obviously not as meaty tasting. Still, an excellent choice if you'd rather have pork than beef. March 24, dessert. 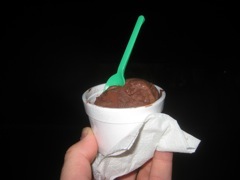 Chocolate gelato from Bacio, the Italian gelato store on the main drag of Cozumel. March 24, breakfast. 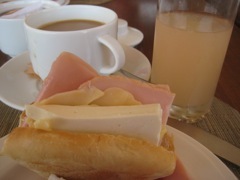 Grapefruit juice, coffee, and a sandwich of cheese, ham, and a roll. At the Hotel Fiesta Americana in Cozumel. March 25, late lunch/early dinner. At the Gold Bar in Cozumel. 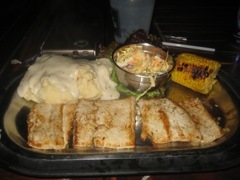 A fish thingy with mashed potatoes, corn, and cole slaw. March 26, breakfast. 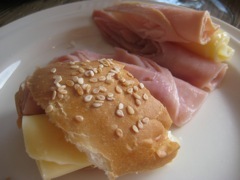 A sandwich of ham, cheese, and so on. At the Fiesta Americana in Cozumel. March 26, breakfast. And a little chocolate roll. Adorable. Cozumel, Mexico. March 26, lunch. Sandwich of mystery meat, guacamole, cheese. On board, before heading off to more diving. Yum. Well, the diving, anyway. Cozumel. March 26, dinner. In Cozumel. Bits of cheese on toast as an appetizer. March 26, dinner. 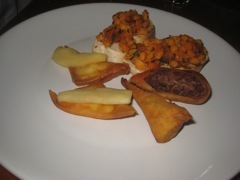 A mixed appetizer platter. Bruschette, an involtini, some apple bits. Italian but in Cozumel. Nice try, but it just didn't work very well for me. March 26, dinner. 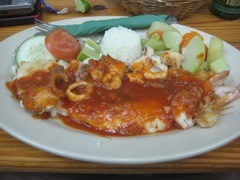 A misto di mare at an Italian restaurant in Cozumel. 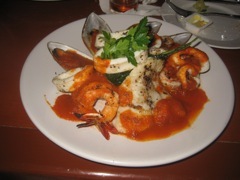 Mussels, shrimp, sea bass, calimari, and some marinara sauce. It didn't taste as well as it sounded on the menu. March 26, dessert. A bit of apple cake with ice cream and a drizzle of chocolate sauce. March 26, dessert. 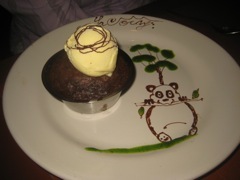 more of the same, but also beautifully decorated plate. Cute. 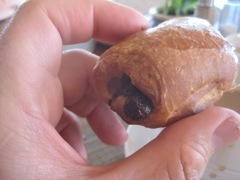 March 27, breakfast. 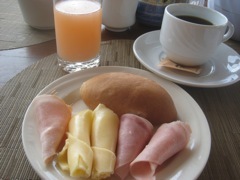 What is fast-becoming the "Cozumel Usual:" bread, cheese, ham, grapefruit juice, coffee. March 27, Lunch. 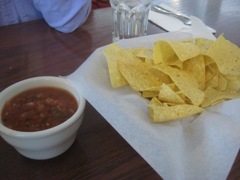 Chips and Salsa, Houston airport IAH. Not bad for chips and salsa, but, still, they were chips and salsa. I mean... how much chips and salsa can you eat? March 27, lunch. 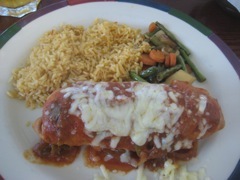 A chimichanga. They wouldn't not-fry it, which indicates that it was made, fried, and probably frozen a week or more ago. On the other hand, I'm at an airport, so what the hell do I expect? Well, in Houston, better than this. 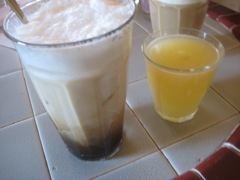 March 28, back home in Tucson, breakfast, the Usual! March 28, lunch. At Taco Bron, now called La Bonta or something like that. 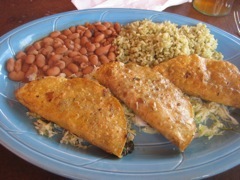 Three tacos Gobernador, which are shrimp tacos fried in canola. Rice, beans, light salt and some cabbage. Generally good, but not as good as when it really was Taco Bron. Sigh. With Jan.
March 28, dinner. 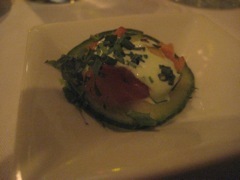 At Jax Kitchen in Tucson with Mom & Jan. A little amuse bouche of cucumber salmon and creme fraiche. 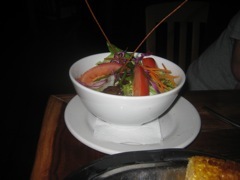 March 28, dinner. 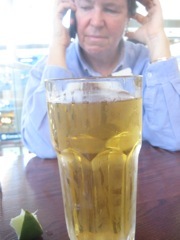 At Jax Kitchen in Tucson with Jan and Mom. 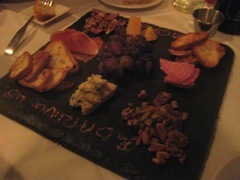 An appetizer of mixed cut meats, cheeses, fruits, and some nuts. A good assortment for an antipasto. March 28, dinner. At Jax Kitchen in Tucson with Mom and Jan. On potatoes, with greens, and crispy onions, this bit of pork was very tasty. We drank a Bonneau Pinot Noir that complemented it very well.